Chat offline Internet is no longer a dream or something unthinkable thanks to FireChat , app that is all the rage since its launch in stores. A part of WhatsApp , WeChat , LINE , Skype or Telegram still a little room for innovative and that is occupied is fantastically app that works offline. The app has two options of chat offline and the first one is related to a room where they can talk to people from all over the world and the truth is very disorganized, chaotic and uncomfortable. It is a kind of board where anyone can say whatever he wants and it is quite difficult to follow a conversation due to the amount of messages entering instant. 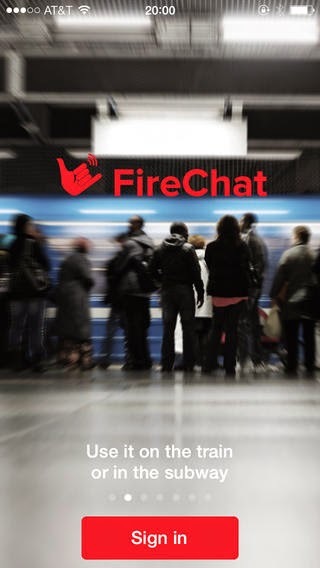 FireChat application is ideal for communicating in remote locations, routes, beaches and music concerts where it is impossible to send messages. You're probably wondering as does FireChat application to send messages without being connected to the internet and I'll tell you below. They are the same application users who extend the space where you can chat without internet connection being is the reason why you can not engage in conversations with people as far as is possible with apps that rely on connections or 3G wireless . With these quality tool has become the most downloaded social choice in 80 countries What do you think? Main use : I personally believe that the greatest use can give recitals or events. Dato : works best with people who are in a close radius to 10 meters.